The Chevrolet Impala is a full-size automobile built by the Chevrolet division of General Motors. The Impala became the best-selling automobile in the United States when full size models dominated the market and competed against the Ford Galaxie 500 and the Plymouth Fury. From 1958 until 1965, it was Chevrolet's most expensive passenger model. After reaching its sales peak, Chevrolet introduced the Caprice in 1965. The Impala was then positioned down one trim level but still above the economical models Bel Air and Biscayne, and remained the most popular full size Chevrolet model through the mid-eighties. The Impala, named after the southern African antelope, is most readily distinguished by having three sets of taillights featured for many years. The Impala SS nameplate was introduced in 1961 and continued through 1969; was revived in 1994 through 1996, and revived again for the 2004-2009 model years. The Impala nameplate is currently being used for the front-wheel-drive model since 2000. Totally redesigned in 1965, the fourth generation Impala set an all-time industry annual sales record of more than 1 million units in the U.S., which has never been bettered. All new full-size Chevys eschewed the "X" frame for a full-width perimeter frame, a new body which featured curved, frameless side glass (for pillarless models), sharper angled windshield with newly-reshaped vent windows, and redesigned full-coil suspension. In 1965, Chevrolet introduced the Impala Caprice. Beginning with the four-door hardtop sedan body, Impala Caprices received unique upholstery, wood grained accents on the dashboard and specialty pulls on the insides of the doors. The Caprice Custom was reintroduced as the Chevrolet Caprice in 1966, taking the top position in the full-size Chevrolet lineup. 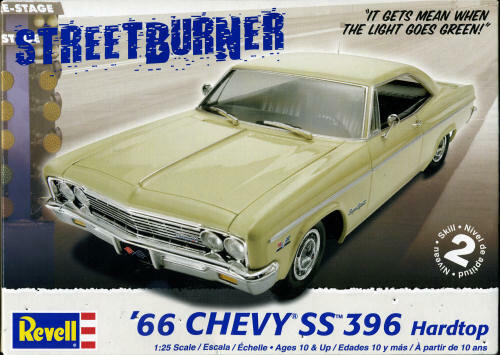 Engine choices included the inline six-cylinder as well as the famous Chevy small-block and big-block V8s. Automatic buyers were given the option of the newly-introduced three-range Turbo Hydra-Matic transmission for the newly-introduced Mark IV big-block engine, displacing 396 cubic inches. The old 409-cubic-inch (6.7 L) "W" engine was discontinued early in the 1965 model year, so early-production '65s got the 409, as well as 1/10th of 1% had the 396 CID big-block. Moreover, other later-built cars had the 396-cubic-inch (6.5 L) as the big-block option with significant horsepower drawback. Two-range Powerglide, as well as Synchro-Mesh 3- and 4-speed manual transmissions were available. As with previous years, Impalas featured more chrome trim inside and out, with pleated tufted upholstery and door panels. The Impala would be the #2-selling convertible in the U.S. in 1966, with 38,000 sold; it was beaten by the Mustang by almost 2:1. This is the 1966 Impala SS version with the 396 cubic inch engine and a Turbo-Hydramatic transmission. I can't imagine putting a slush-glide in a car like this as it would soon be suffering from blown transmission seals as the hot-rod youngsters tried torquing up the transmission while drag racing with friends! I'm not a major car freak so have to assume that this is a new mold kit and not a rehash of something from years back. The molding is pretty clean with no flash or sink areas or short shot items. There is some mold seam work that will need to be done on most parts, but that is part and parcel for car kits. Four vinyl tires and a nicely done clear sprue for the windows is included. This is not a one-piece clear section as all the windows are separate. No roll-up side or rear quarter windows are included. I would recommend painting the body prior to assembly so that the chrome trim around the windows can be taken care of before installing the windows. The kit includes a full engine and suspension with all the proper engine compartment accessories. A full interior with front bucket seats is included. Decals are provided for all the dash instruments. The hood is designed to be hinged with plastic hinges. Remember the steel spring hood hinges? Thankfully those are no longer in vogue. Instructions are very well done with 8 major construction and painting steps. All of the parts are named and any color information is also included. 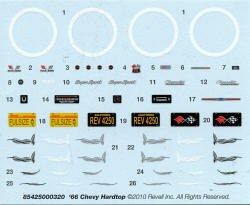 A nice decal sheet for the license plates, instruments and thin white walls for the tires is included. This also includes some pin striping detail that would not be appropriate to a stock vehicle, but is provided in case you want to use it. No color is provided, but one who is really into this can get a variety of factory standard colors for this car from aftermarket paint suppliers. Anyone who is a collector of Chevrolets will have to have this one in his collection. It looks spot on and if it is a new mold kit, it should be a delight to build.